An advanced Droid starfighter made by the same company that produced the superlative Droideka Destroyer combat droid, Colicoid Industries. The Tri-Fighter proved to be a truly formidable foe, the equal of anything the Republic could throw at them - with the possible exception of a Jedi Knight. 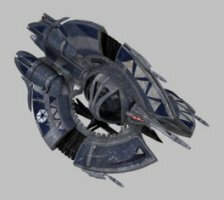 The Tri-Fighter lacks the limitations of the Vulture droid series, using more conventional (and more expensive) parts that allow it to equal the endurance of any fighter it faces. The Tri-Fighters can carry up to six missiles, and fire up to three at a time at the same target.